Measuring an impressive 9 out of a possible 10 on the scale of mineral hardness. With proper care and cleaning, your Jeulia Stone can be treasured for a lifetime. Our proprietary stone is hand-cut and faceted in-house to shine brilliantly and provide a beautiful sparkle with bright, vibrant color. It can also be created in colorless form, which we use in our jewelry to simulate the amazing fire and brilliance of a natural diamond. We are confident that you will not find a better alternative in the market that shares the same quality and affordability as our Jeulia® Stone.Our commitment is to avoid putting more strain on our natural resources with providing gemstone that are 100% traceable. 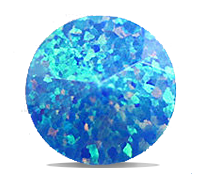 In keeping with our tradition of offering the finest simulants in the world, we also offer simulant fancy colored stones. By filtering from the stone color on the category pages our craftsmen offer you the option to select jewelry with colored stones. 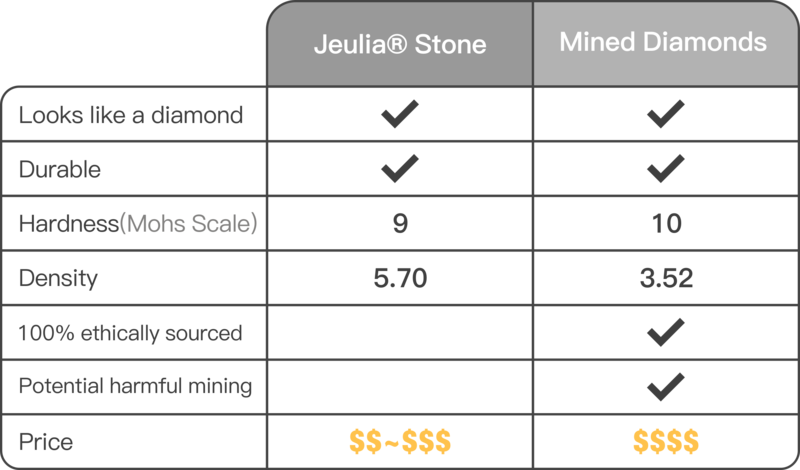 Diamond White Jeulia® stones has the same brilliance and durability as a natural diamond but at a fraction of the cost. For centuries, diamonds have been adorned by women and men and was regarded as a symbol of eternal love. Today, diamonds are still the most precious and valuable stone in the world. Diamonds are associated with celebrities and royalties alike. Sapphire Blue Jeulia® stones share the same connotation of real sapphires and they are an excellent alternative to this precious gemstone. Sapphire has long associations with faith and purity, and is believed to help with communication, insight and inspiration. The ancients believed that sapphires could help them to predict the future. Ruby Red Jeulia® stones carry the same aura of love and beauty as a real ruby. Ruby is known to protect its wearer from misfortune and illness. Given as a gift, ruby is a symbol of friendship and love. Ruby is also July’s birthstone. Emerald Green Jeulia® stones possess the same hue and saturation as a precious emerald but are more durable than what you would find in nature. Emerald symbolizes health along with various healing abilities. It is known to provide insight into the future. Emerald is also thought to bring wisdom to people and it is the traditional birthstone for May. Fancy Yellow Jeulia® stones are admired for the canary complexion they display. A fancy Yellow gemstone is said to open the mind to new thoughts and balance impatience and restlessness. It is thought to promote optimism. Champagne Jeulia® stones display a rich and golden appearance that can be quite mesmerizing. Cognac and chocolate-colored diamonds have grown in popularity in recent years as brides and consumers look for non traditional alternatives to the colorless counterpart. Fancy Pink Jeulia® stones are as luminous and breathtaking as the real ones. A pink gemstone is known as the stone of "gentle love", it brings peace and calm to relationships. Excellent for healing emotional wounds, removing negativity and restoring harmony after conflict. Amethyst Purple Jeulia® Stones are as vivid in color and share the same significance as the real purple variety of quartz. Amethyst calms the emotions, encourages clarity of thought, and assists in attaining wisdom. It is also the traditional birthstone for February. Opal Jeulia® stones are famed for showcasing a vivid play-of-color that has often been compared to the galaxy, a rainbow and fireworks. As the birthstone of October, they are considered to be a powerful stone that induced mystical vision and enhanced creativity. Opal gemstones are pretty, precious and dainty.